So, I assume you're a professional runner correct? If I see someone wear a football jersey, I know they're a fan. If I see someone wear a basketball jersey, I know they're a fan. If I see someone wear a hockey jersey, I know they're a fan. If I see someone wear a soccer jersey, I know they're a fan. If I see someone wear NASCAR stuff, I know they have a thing for their relatives. I would never think anyone of the above are/were professional athletes because they're wearing a $150 team jersey or paraphernalia. When I see someone post or complain about hobby joggers it means they're probably single, bitter, and not really very good at running fast. And please don't boast about your 2:20ish or 14:40 PRs unless you're a girl or plan to compete in the female division. Another point here- how many people on this site are REALLY elite runners? If you think you are, would anyone even recognize you? Are you in any record books of any significance? Are you able to make a good living as an elite runner? Ok so you aren’t so important after all. I bet 99% of people on this site are more like ‘hobby joggers’ running for fitness and fun. Do you think events could be held without fees paid by hobby joggers? Think great running shoes would exist without the hobby jogger market? If I go to the super bowl and buy a t shirt to wear at home, doesn’t mean I claim to have suited up for the game. Same with a Boston jacket. Last thought- if you think you are elite, not a hobby jogger, but were sitting at home not running at Boston, I guess you aren’t so elite in my eyes! Ok, I just came back to this post and here's what I need to say: the group of people who have a Boston jacket is anyone who's qualified for Boston. 3:01 would be the slowest person who has one. So that "Hobbyjogger" you're mentally shitting on could actually be a 2:20 guy. Hell, I finished in the top 10% of runners at my state meet and I take my state qualifier backpack with me everywhere. The ironic part is there's a good chance that Boston jacket-wearing "hobbyjogger" is faster than you. Ha ha ha!! Stunning lack of self-awareness - 2:43 doesn't make you some kind of great runner, far from it. What it does make you though is a prototype Boston jacket wearing hobbyjogger? I assume you have a marathon PR that commands appearance fees to major marathons and make a living out of running. If that is the case, you should not throw s**t at your cash cow. If that is not the case, then you are an hobby jogger. I am not really a medal fan, but after finishing Boston in today's conditions I will be wearing the medal for the rest of the day. And I am considering buying a jacket too. It was the hardest race in my life and I considered dropping out many times along the course. I am proud I did not. OP is of the first group. These are people who ran competitively in HS and college and were pretty good; maybe even very good or sub-elite. These people know what it’s like to train at a highly competitive level, be genuinely very good, and still get your arse kicked. These people view running primarily as a competitive activity. The second group is chiefly people who were slower in HS and/or started running later in life. Most of these people enjoy running as a personal activity and vehicle for self-fulfillment. They may or may not worry about beating their age-group peers, but mostly running is a “man vs. self” affair for them. 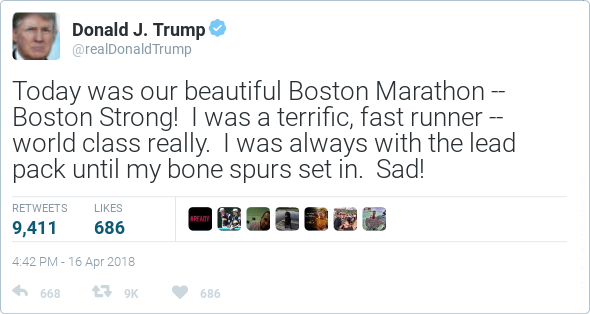 Many of these people enjoy sharing their running accomplishments with friends and family, who are supportive. Group 1 sees the Boston jacket as a “participation trophy”, an obnoxious thing used to show off for non-runners and claim a level of prowess that isn’t really there. Group 2 sees the jacket as a fun symbol of a meaningful personal achievement, which will also prompt postive affirmation from friends. Group 3 doesn’t give a hoot about the jacket beyond the level of exchanging pleasantries with enthusiastic fans. OP, who died and made you Pope? It doesn't mean you are a hobby jogger - hobby jogger is a relative term. Compared to a 2:05 guy, a 2:25 guy is a hobby jogger. Somebody wearing a Boston jacket is just a DORK. ha same...went to in-laws for the week and forgot running jacket...went to Marshalls and found a Nike Chicago Marathon jacket for $15. It's been my running jacket for the past 5 years. Glad I'm not the only one, haha! I figure the chances I run into anyone who even knows what it is while I'm running down here in Mississippi are quite small. And it's not a bad little jacket for $25. Yes. And please don't wear the Boston jacket.